Focus is given to the three E’s: education, empowerment and enrichment. And while low- to moderate-income children and teens are the target, all are encouraged to participate. As ACT proves time and time again, inspiration knows no bounds. “How do we prepare students to problem solve? How do we teach them to be leaders? We show them what’s possible,” says Harris. Harris uses the arts as a catalyst to demonstrate what’s possible on small stages and large, here in St. Petersburg and out in the world. Whether a pupil’s future holds a career as a world-class performer or not, one thing is for sure: ACT opens up a world of possibility — one its performers may never have experienced otherwise. Washington Davis spent many hours in Arts Conservatory for Teens classrooms from the age of 12 onward and thrived as a spoken word artist and slam poet. Inspired by those who helped her gain confidence, she created the organization Sista2Sista to mentor young girls. Her selflessness led to a Nickelodeon HALO Award in 2011 and nationwide recognition. She now teaches ACT children as a featured artist and refers to the organization as family. Recently married, she chose ACT artists to provide entertainment at the reception. In her future, she sees continued involvement in the program as she helps the next generation. A student’s arts mindset thrives in one of the before or after-school ACT programs taught by knowledgeable instructors, she says. It often continues with field trips to show what they can aspire to become. As students progress in their chosen craft, they hone their skill and see improvement. Today, as its instructors look to further their mission of exposing young people to the possible, they do so with a close eye on cultural popularity. Class schedules don’t read like a standard arts provider’s might. There’s dance, choral performance, acting — all the classic disciplines — but also photography, drum line, videography. John Collins has been a fan of the progressive program for years. The executive director of the St. Petersburg Arts Alliance sees ACT as a quality group with much to offer area youth. 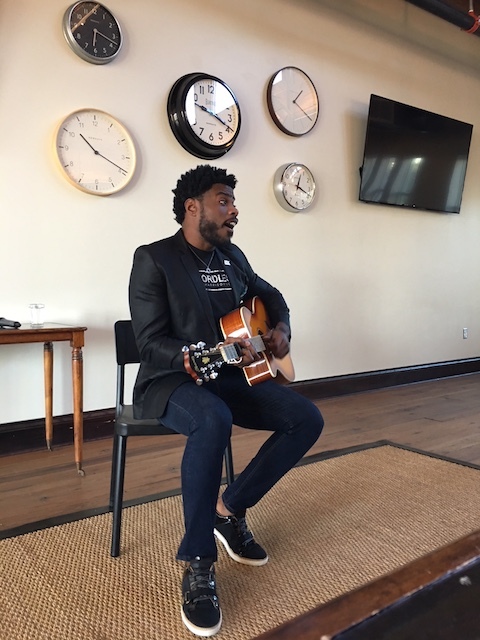 The Arts Alliance often hires ACT students to perform at events, he says, because the talent pool is deep and the organization’s mission is solid. Alex Harris of Arts Conservatory for Teens performing at Cafe con Tampa at the Oxford ExchangeWhat’s new for ACT? It’s early morning at John Hopkins Middle School, and adolescents trade yawns for acting exercises. This is the morning drama workshop led by ACT instructors, one of five classes available to these students during the hours of 7:45-9 a.m.
“We’re teaching character essentials through the arts to these kids,” Harris explains. One class convenes to shake off the morning cobwebs with hip-hop dance. A group of students nearby learns vocal technique. The video production pupils are honing their technical skill; eventually, they will shoot a short film. The early hours offerings are new additions to the list of long running after school ACT classes held at the Enoch Davis Center and USF St. Petersburg. So many more courses could be available to these kids, Harris says: he has hundreds of interested applicants willing to volunteer or instruct. Professional instructors are key to instructional quality. More funding would open that door. Visit Studio@620 in St. Petersburg, and you may catch a performance by one of Harris’s protégés. University of South Florida St. Petersburg hosts the Young Artists Alliance for advanced students, and local theater powerhouses American Stage and freeFall Theatre Company have stepped in to offer support in the past. Harris received the 23rd Lightning Community Hero Award for 2016-17. He donated the $50,000 award to ACT and pledged to keep preparing students to effect change in the world. Harris, a Georgia native and graduate of Harvard University who lives in Tampa, is now looking to expand the ACT program into other Florida school districts, including Hillsborough. For more information, to donate and to view class schedules, visit the Arts Conservatory for Teens website. A recording artist and producer himself, he says nothing compares to seeing his students shine. Watch and listen to Harris’ new hit single with a powerful message at this link.